Pictures of PA circuitry under development. An excellent example of the term "bread boarding"!! 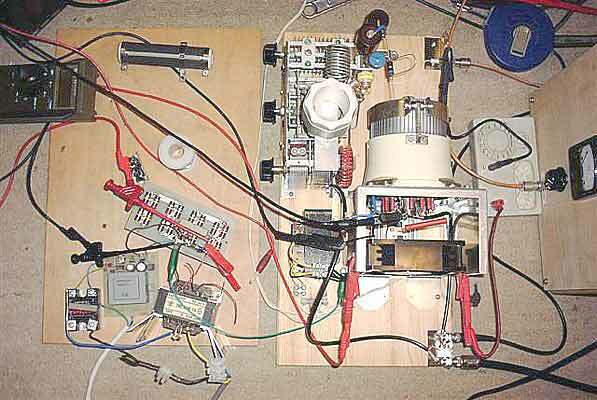 This experimental design is capable of 1.5kW output throughout the range 1.8 to 30MHz, 5W drive delivering 300-400W. 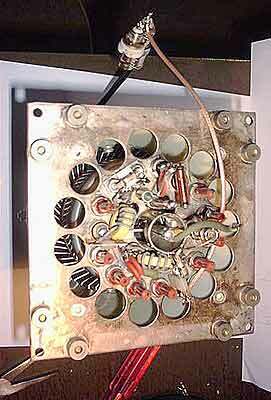 The input is "swamped" by the 50 Ohm grid resistor eliminating the need to use tuned circuits to match the input circuit on the amateur bands. The simple screen supply incorporates protection circuitry comprised of a small 230V/15W household lamp as a constant current device. If the HV fails or the amplifier is not correctly tuned or is overloaded, the screen grid dissipation is limited to a safe value. If the pi-network output circuit is determined empirically for lowest screen current and maximum output, the screen supply is quite adequate and stabile. In practice the GU-43B and equivalent Polish Q-1P/41 and Q-1P/42 are very rugged; they withstood temporary overload during my tests: screen grid 300mA, anode current 2A and 100W drive without 6dB attenuator. 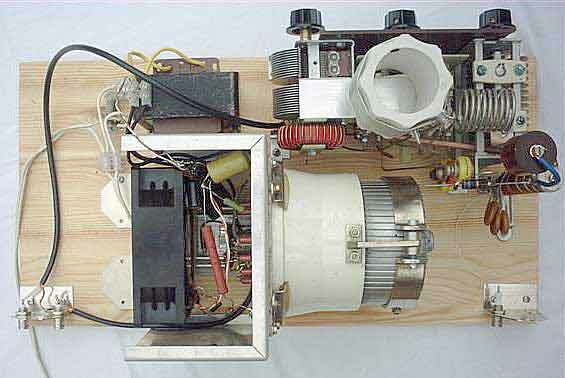 The GU-43B is extremely stabile in this design; no sign of oscillation even without in- and output loading. 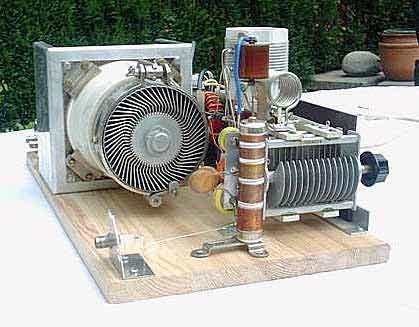 Lowest screen current occurs with anode voltage 3kV < Ua < 3.3kV. With normal speech the screen current should flicker about zero mA (+/- 5mA). With a carrier ("key down") the screen current is about 20mA positive. Q-1P/41 is a silver plated GU-43B; Q-1P/42 is a silver plated and ceramic GU-43B. Both types have a better amplification factor than the Russian GU-43B. They need 1.0 to 1.5V more negative bias (e.g., extra 1-2 diodes in series) and deliver 100-200W more output power.